The Bell 412 is a utility helicopter manufactured by Bell Helicopter Textron. It is a further development of the Bell 212 model, the major difference being the composite four-blade main rotor. Utility transport helicopter for the Canadian Forces. Advanced training helicopter based on the Bell 412EP, operated by the RAF since 1997 as an advanced flying trainer. Operated by the Defence Helicopter Flying School at RAF Shawbury and the Search and Rescue Training Unit at RAF Valley. Search and Rescue helicopter based on the Bell 412EP, operated by 84 Squadron RAF since 2003 at RAF Akrotiri in Cyprus. Civil utility transport version, built under licence in Italy by Agusta. 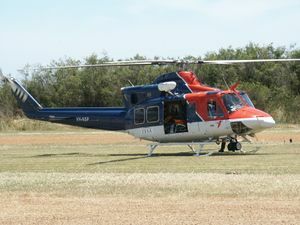 Italian-built version of the Bell 412EP. Military utility transport version, built under licence in Italy by Agusta. Italian-built version, fitted with a ground surveillance radar. 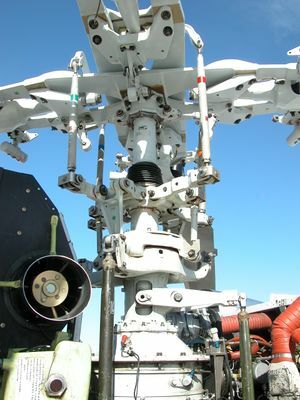 Rotor head and transmission of a Bell 412. This page was last edited on 22 January 2008, at 07:02.